Maccabi Electra Tel Aviv took care of business against Lokomotiv Kuban Krasnodar on Thursday at Nokia Arena, pulling away late for its sixth straight Turkish Airlines Euroleague victory and third win this season over Lokomotiv. 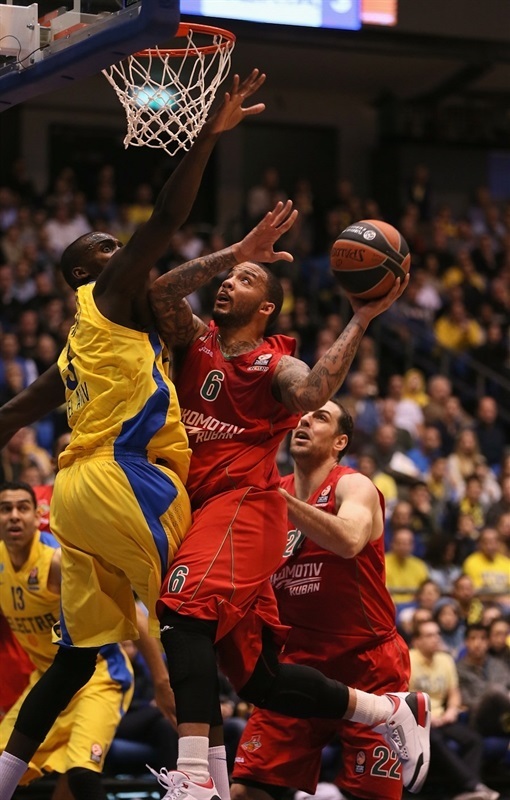 Sofoklis Schortsanitis, making a surprise start after a previous sprained ankle diagnosis threatened to sideline him for several weeks, dominated inside and Devin Smith added a double-double to pace Maccabi, which improved to 2-0 in Group F. The loss dropped Krasnodar to 0-2. 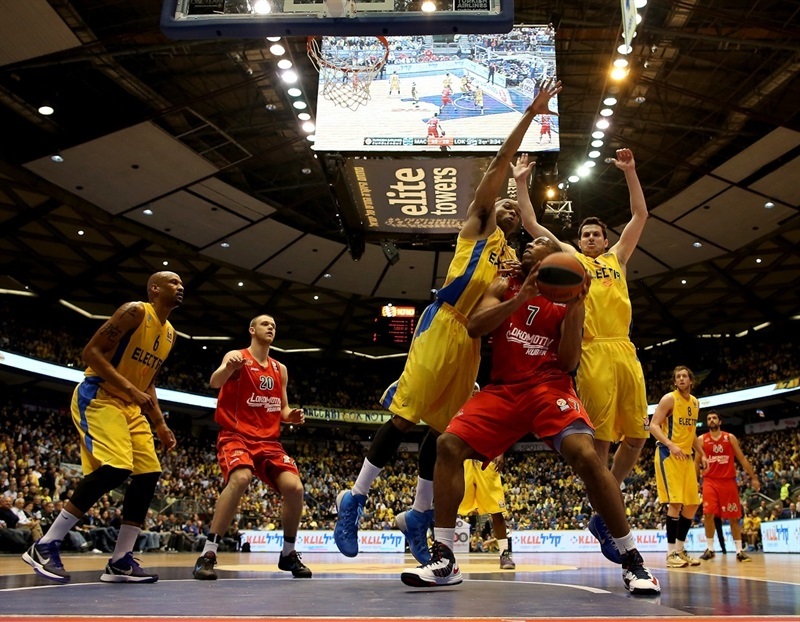 The visitors let briefly late in the third quarter, but Maccabi used a 12-2 run in the fourth to take the first double-digit lead of the game and never looked back. Big Sofo scored 14 first-quarter points to set the tone and despite foul trouble limiting his playing time, amassed 22 points in 15 minutes. Smith added 15 points and 12 rebounds, while Tyrese Rice tallied 12 points and 6 assists off the bench. Mantas Kalnietis led Lokomotiv with 18 points and 8 assists, Richard Hendrix posted 13 points, 9 rebounds and 2 blocks against his former team and Marcus Williams scored 13 in defeat. The visitors won the opening tip and Kalnietis found Hendrix inside for the game’s first points. Schortsanitis answered inside for the hosts. Sofo remained Maccabi’s first choice in the paint and Yogev Ohayon gave the home side its first lead from the line, 5-4. 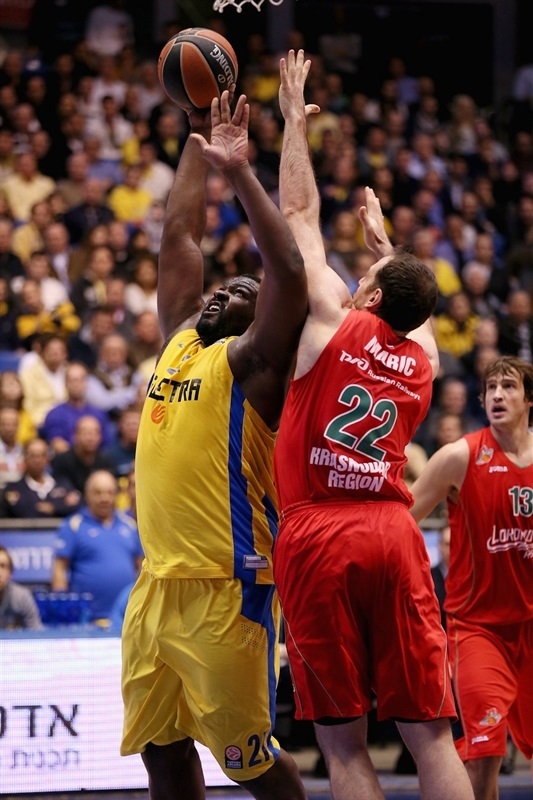 Schortsanitis accounted for two baskets on one trip downcourt as he scored, was fouled, missed the resulting free throw and after the ball went outside, Ohayon found the big man for a bucket inside. Aleks Maric reacted to having his shot blocked by finding the ball and sending it in, but then the red-hot Schortsanitis completed a three-point play, giving him 11 points as Maccabi grabbed a 12-7 lead. Sofo took a seat less than five minutes into the game. Former Maccabi shooter Simas Jasaitis sank a jumper for the visitors. 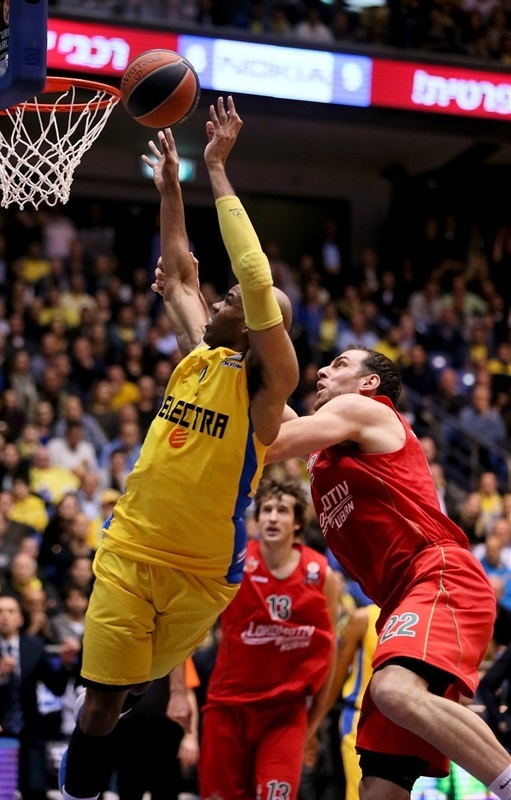 Schortsanitis replacement Alex Tyus drew an unsportsmanlike foul from Maric while attacking the basket. After a Ricky Hickman floater, Williams sank the game’s first three-pointer. A second foul on Tyus brought Schortsanitis back after a short rest. Kalnietis tied the game at 16-16 with a pair of free throws, but Sofo overpowered a double-team for a three-point play. Loko stayed close as Hendrix stuck Schortsanitis with his second foul and sank the resulting 2 free throws. Derrick Brown split free throws to tie the score. Ohayon and Kalnietis traded penetrations to keep the sides even at 21-21 through 10 minutes. David Blu sank a long jumper and Shawn James sank a baby hook to put the hosts up 4. Hendrix took the ball away from Blu, but the visitors did not convert. 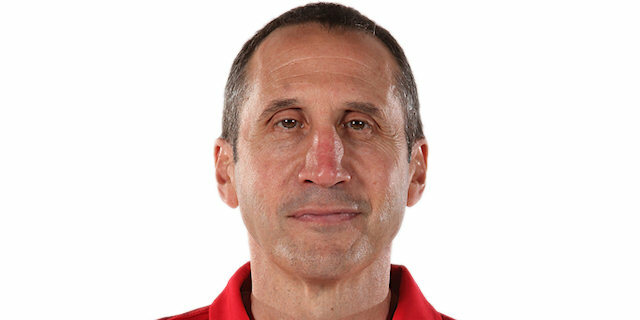 James’s sweet pass to Joe Ingles made it 27-21. Lokomotiv responded quickly through a Kalnietis triple and a drive from Williams. Rice drilled Maccabi’s first three-pointer. Minutes later Ingles added another for a 33-26 lead. Schortsanitis spun Hendrix for a basket that brought the crowd to its feet. Loko fought back through a Krunoslav Simon basket before Schortsanitis’s offensive foul landed him on the bench. Sergey Bykov made an impact with 5 points, which sandwiched a Smith triple. 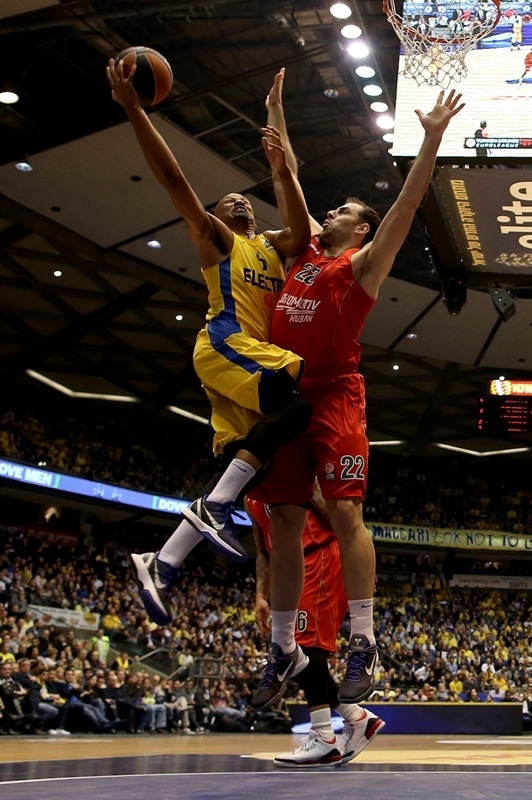 Ingles kept Maccabi in control, 40-33. Rice floated inside for an acrobatic layup. Andrey Zubkov and Smith traded threes. Simon sank a floater to close the gap to 45-38 at the half. Hendrix scored down low and Jasaitis rose for a tip-in as Lokomotiv drew within 3. Schortsanitis got to the line again and split free throws. A wide-open Hendrix buried a three to make it 46-45. 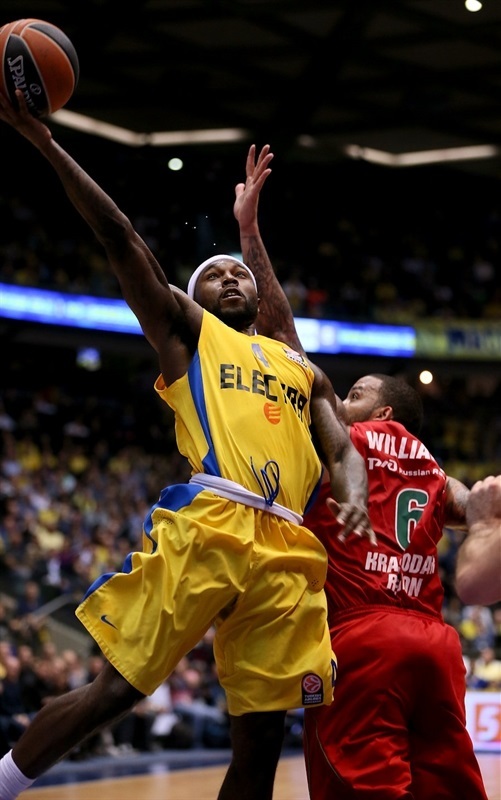 Needing points, Maccabi went to Schortsanitis, who scored with ease on back-to-back possessions. 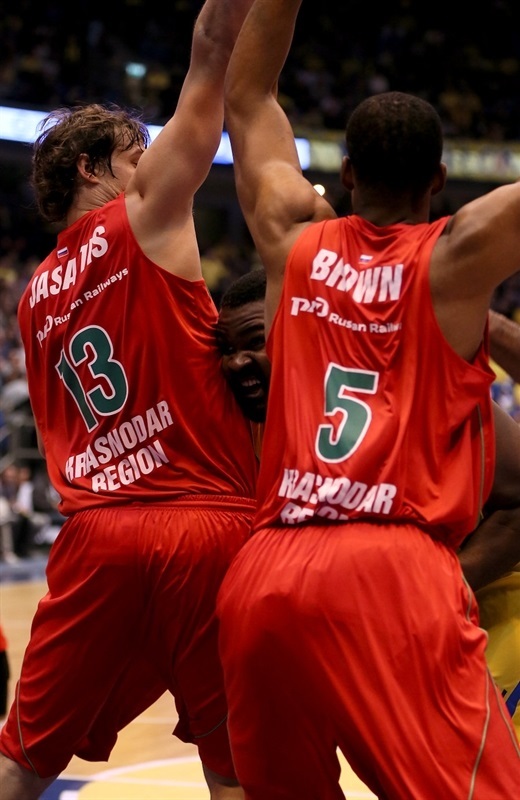 A triple from Williams kept Krasnodar close. 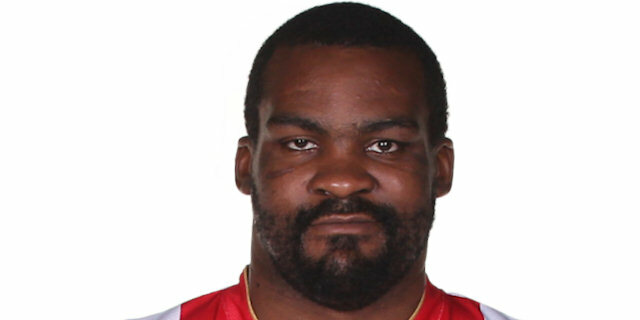 Schortsanitis’s first miss of the game came midway through the quarter. Loko battled on and closed to within 1 on a Kalnietis three and took the lead, 54-55, on a basket by Brown. The lead swung back to the hosts as Guy Pnini converted a four-point play. 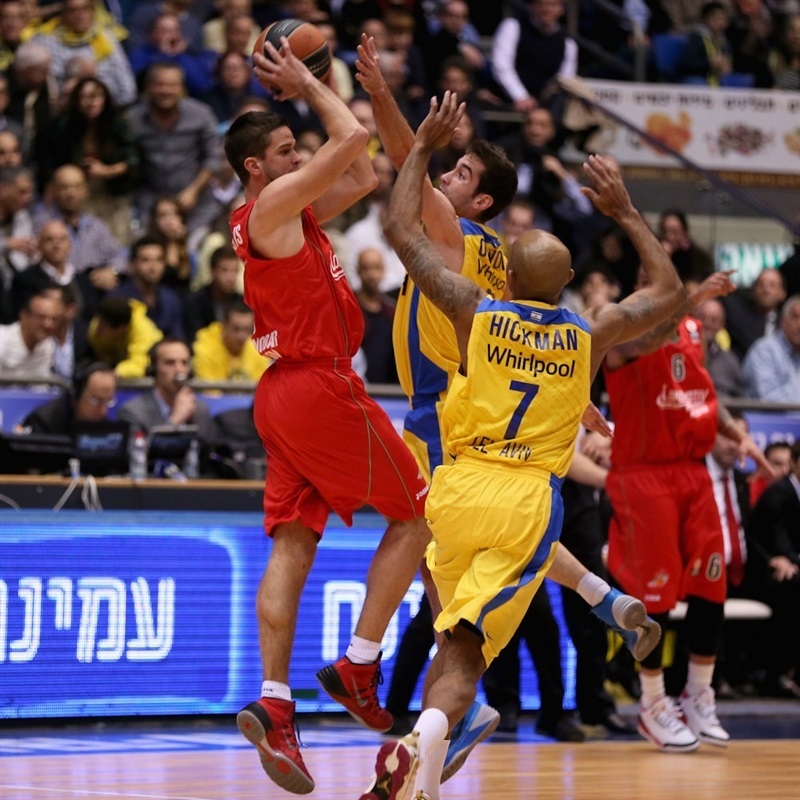 Williams and Pnini traded threes as Maccabi remained on top. Hendrix free throws made it a 1-point game. Kalnietis’s layup put the visitors back in front, but it was short-lived. Rice beat the third-quarter buzzer with a three to make it 64-62. 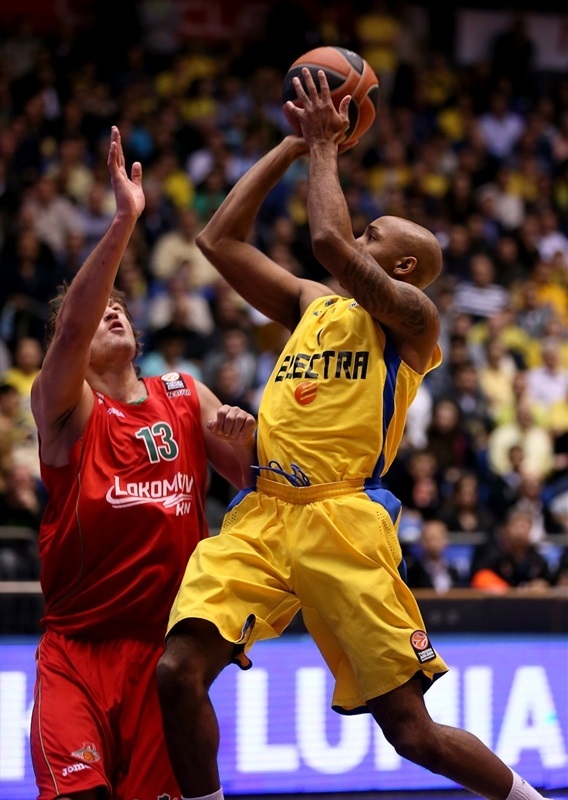 Schortsanitis split free throws and a Hickman steal led to a Blu basket and a 5-point Maccabi lead. Big Sofo took a seat with 4 fouls and Brown sank the resulting free throws. James scored inside, but Williams penetrated for a layup to get within 69-66. After the Maccabi defense forced a 24-second violation, Blu buried a three and Smith made free throws to extend the lead to 8. Simon came up big with a block that he turned into a layup, but Smith trotted down and nailed an open three. Rice gave the hosts their first double-digit advantage, 79-68, with four minutes to play. James rejected Zubkov and Hickman scored on the ensuing break capping a 12-2 run as the Maccabi fans started to dance in the aisles. Following a timeout, Kalnietis and Hickman traded baskets. Lokomotiv kept running its offense, hoping to trim the deficit for tiebreak purposes, but Maccabi finished in style and celebrated another big win. "We didn't trick anybody. As of Tuesday Sofo was out. I have to give credit to our doctors and physical therapists that that did wonderful work. Yesterday he was on crutches, today he came dressed for the morning shootaround. We looked at each other and he said to me, 'I’ll be there.' Sofo gave a great game and great basketball. He set an example for everyone. This morning I told him not to train, to go for more treatment, to come tonight and if he could he’d play a few minutes, just to give everyone a push and to lift the crowd. He didn't take my advice and decided to play a great game. That’s not something you see every day. " "Nobody knew how things would go and I’m just glad that I was part of an excellent game for us. We played well as a team and I’m glad Shawn is back. That gave us more power. It’s fun to be a part of this team. It was great to hear the crowd. I love them and really appreciate their support. I’ll do my best to meet their expectations. "